Selling Your 1st Generation iPod Touch? Are you thinking of selling your 1st Generation iPod Touch? Use our price comparison engine to find the best price for your 1st Generation iPod Touch. We have screened all of our partners to make sure that you are only transacting with reputable companies. You can get paid for your old, used, or unwanted 1st Generation iPod Touch and receive cash in as few as 10 days. You're moments away from finding the best offers and buyers for your 1st Generation iPod Touch. 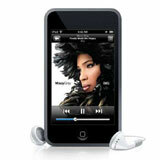 Let uSell.com help you sell your 1st Generation iPod Touch, by choosing your iPod model. Then all you have to do is, tell us about your 1st Generation iPod Touch, select the best offer for your used or unwanted iPod, check out and get paid.